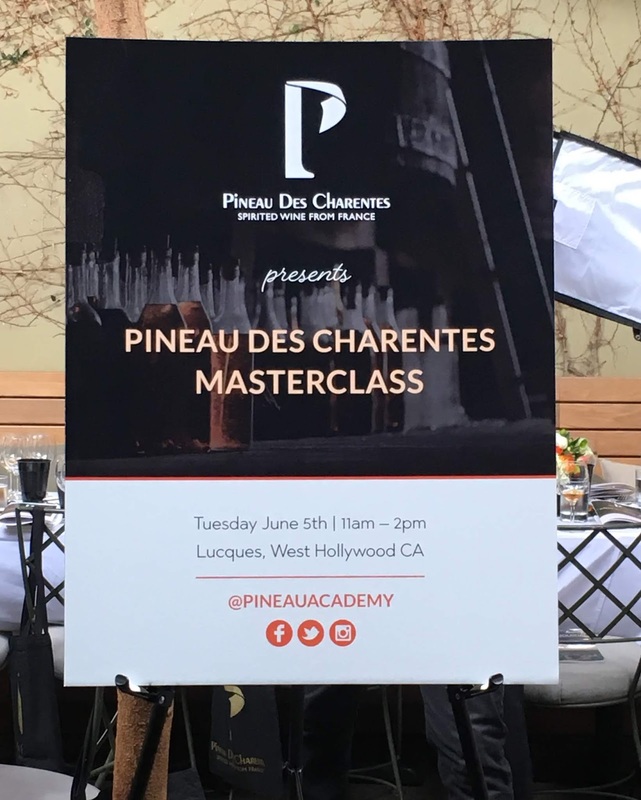 Over the summer I had the opportunity to attend a Pineau des Charentes tasting at Lucques in Los Angeles. And I can confirm that I had no idea what Pineau des Charentes was before this MasterClass! But, I am VERY glad I went as I am now looking to integrate Pineau in my cocktailing wheelhouse...and I think you should too! It is an easy, and not to expensive way to “Up Your Cocktail Game”. Where is AOC Pineau Des Charentes? It is in the same region as Cognac, on the western coast of France. Pineau des Charentes gained AOC status in 1945, though it has been made there for 400+ years. The AOC gives a strict set of rules including: area of production, varieties to use, vine trimming, yields, and production methods. Also, no additives, sugar, coloring, or caramel are allowed. The climate is maritime (warm summers, cool winters, and close proximity to a large body of water). What is Pineau des Charentes? Pineau des Charentes is a French fortified wine with only two ingredients: pressed grape must and cognac eau de vie (3:1 ratio). The grapes from both the must and the eau de vie have to be from the same vineyard and made by the same people in order to express the terroir. The unfermented grape must is prevented from fermenting by shocking it with the eau de vie. Pineau has a low ABV (averaging 17%), much lower than spirits which usually hover around 40%. Therefore it is a great lower alcohol alternative to spirits. All Pineau must have a minimum 12 months oak aging, according to AOC rules. The first Pineau was an accident, as many great stories start! A Cognac producer had some unfermented grape must that needed to be stored. It was put in a barrel thought to be empty, but there was some Cognac in it…..voila! Over time the liquid turned into what we now know as Pineau! There are many types of Pineau. The Blanc style is usually made with Sauvignon Blanc and Semillon, while the Red is made with Cabernet Sauvignon and Merlot. From there, the wines are classified by age: Young is < 5 years old, Vieux (Old) > 5 years old, and Tres Vieux (Very Old) > 10 years old. How to enjoy Pineau des Charentes? Ingredients: Pineau des Charentes (young blanc) with tonic, and a thyme sprig/grapefruit peel for garnish. This is a great spring/summer pre-dinner drink. Ingredients: Pineau des Charentes (vieux blanc), Plymouth Gin, Génépy des Alpes (génépy is the primary alpine herb in Chartreuse), a dash of absinthe, and orange bitters. This is a super complex cocktail with layered bitter flavors. The bitters are cleansing and make your mouth water. I also think they’re good for calibration and a great palate cleanser before wine tasting. This would go great with a funky grilled cheese. Ingredients: Pineau de Charentes Jeune Rouge, fresh lime juice, toasted orgeat, China China, and 8-year-old dark rum. This drink was full of bitter flavors. Not for the faint of heart! Fresh fig, stewed apricot preserves, dried grapes, and walnut. This was a very interesting wine. The sweetness registers first, then subsides, then acid/floral, then heat. It finishes almost dry with a savory note. Brilliant. Peaches, plums, prunes, and toasted nuts. I can almost smell the sea/brine. A candied, honeyed note with a warm toastiness. Walnuts, dried raisins, and a faint acid lift. Light rancio on the palate. Savory and sweet, almost medicinal (pine?). So many layered, complex rancio notes: caramelization, toasted nuts, coffee beans, and raisins/prunes. Fresh, fruity with notes of white flower, honey, and vanilla. Flavors of mandarin and dried apricot. More rancio notes. Fruity notes of black cherry and black currant. Floral notes of red rose. Aromas of hibiscus, earl grey tea, and dried cherry. Smells like a still red wine though rancio and chocolate notes are not too far behind. Lots of spice (cinnamon). Flovor of nuts, dried apricots, and well-matured Cognac. Soooo many nuts. Would be good with fresh toasted Marcona almonds. Thank you to The SOMM Journal for an invite to this lovely event!